Bakerpan makes the finest bakeware accessories, including Silicone pans, Spatulas, Oven Mitts Etc. 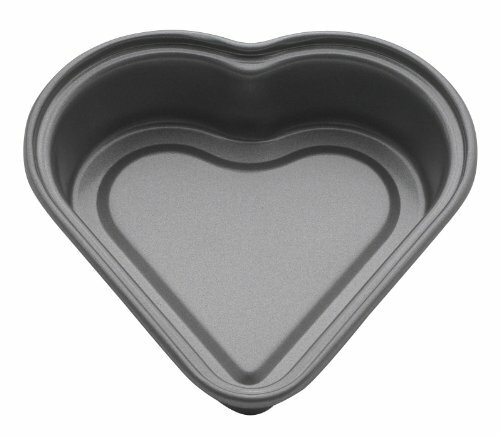 This Silicone heart tray will last a life time. 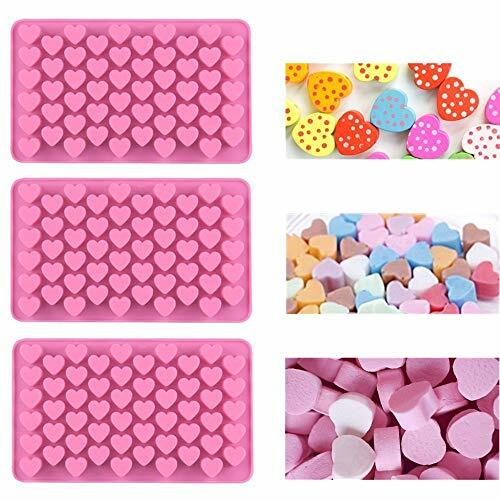 Made of LFGB & FDA Approved silicone, can be used in temperatures from -40 to 446 degrees Fahrenheit, Mold Measures outside 7 3/4"long, 4" wide, 3/4" Tall, Each heart measures 1" in the widest side and 3/4" tall. 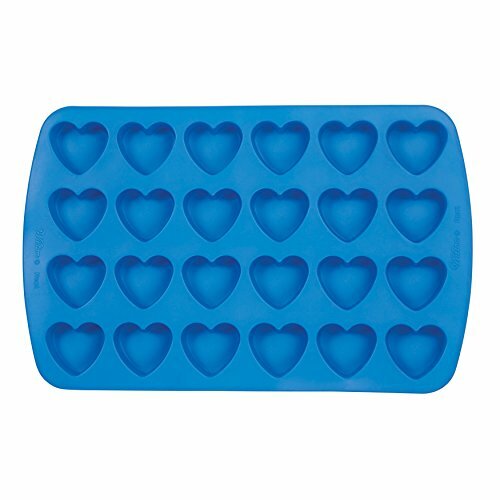 Silicone chocolate molds can be used to make chocolate, jello, ice cubes, marshmallows or any other pastries shaped in a heart. Wash with soap and warm water before use. Product Features: Color: Pink Size: Approx. 7.3 x 4.3 Inch(Lx W) Material: 100% Food Grade Silicone, FDA approved BPA free Temperature Safe: -104℉ to 446℉ (-40℃ to 230℃) Applications:Ideal for making candy, Chocolates, Crayons, Candles, Hard candy, Fondant, Jello, Frozen yogurt treats, Ice cubes, Cake decorations, Party favors for birthdays and baby showers and so much more Package Includes: 3 x Mini Heart Shaped Silicone Molds Service Guarantee: The order can be refunded or exchanged if you are not satisfied with the product receiving. If you have any questions, please feel free to contact us at any time. Material: Silicone Size: Approx. 7 x 4.3 Inch(LxW) Note: Due to the difference between different monitors, the picture may not reflect the actual color of the item. Use and maintenance 1. After each use, wash in the dishwasher or use hot water to clean.Make sure the silicone mold before each use and dry completely before storage. 2. When baked silicone mold should be open in a baking tray.Do not bake it empty.If you only use part of it, please add other parts with water. 3. When baking finish, please remove the pan from the oven out, and place the bakery products in the cold rack until completely cold. 4. The silicon mold can be used only for the oven, oven and microwave oven, never can be used directly on the gas stove and induction cooker, or direct heating use. 5. Do not use the knife or other sharp instruments on the silicone mold, not weight, pulling. 6. The silicone mold dust absorption, easily.Long time need not when, put in the carton, placed in the shade. 7. Don't rinse with cold water immediately after out of the oven, to prolong service life. If you have any questions or suggestions on our product, please tell us in time. We will give you a satisfactory answer as soon as possible. 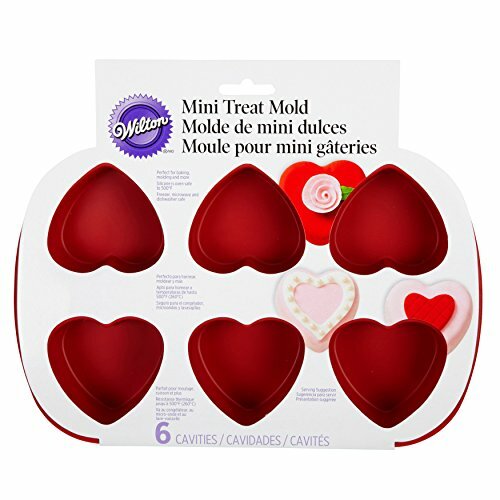 Create your own special desserts or homemade soaps with the Freshware SM-110RD 12-Cavity Silicone Mini Valentine Heart Muffin, Brownie, Cornbread, Cheesecake, Pudding, Jello Shot and Soap Mold. This mold is constructed with 100 percent pure, premium-quality food-grade silicone, which meets US FDA and European LFGB safety standards (BPA-, PVC- and Phthalate-free). Simply pour your favorite recipe in the mold, prepare and cool completely. Then turn it upside down — this flexible silicone mold offers a non-stick surface that allows the baked goods to pop right out with a little push from the bottom. Remember to place the silicone mold on a baking sheet for easier positioning and removal. 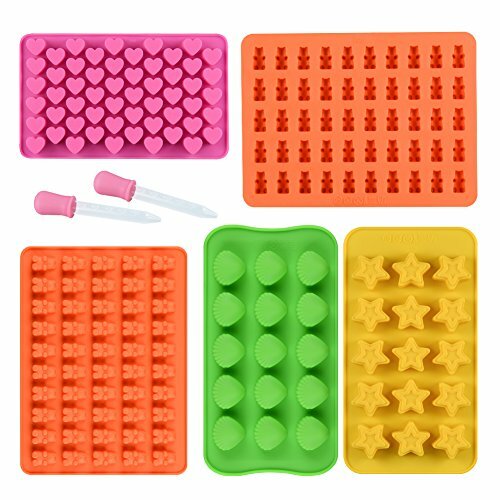 Create your own special desserts or homemade soaps with the Freshware SL-118RD 8-Cavity Oval Silicone Mold for Soap, Cake, Bread, Cupcake, Cheesecake, Cornbread, Muffin, Brownie and more. This mold is constructed with 100 percent pure, premium-quality food-grade silicone, which meets US FDA and European LFGB safety standards (BPA-, PVC- and Phthalate-free). Simply pour your favorite recipe in the mold, prepare and cool completely. Then turn it upside down — this flexible silicone mold offers a non-stick surface that allows the baked goods to pop right out with a little push from the bottom. Remember to place the silicone mold on a baking sheet for easier positioning and removal. 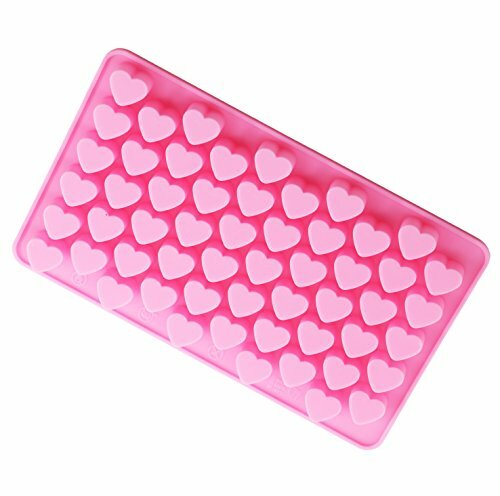 Create your own special sweets or homemade soaps with the Freshware CB-109RD 28-Cavity Heart-Shaped Silicone Mold for Making Homemade Chocolate, Candy, Gummy, Jelly and more. This mold is constructed with 100 percent pure, premium-quality food-grade silicone, which meets US FDA and European LFGB safety standards (BPA-, PVC- and Phthalate-free). Simply pour your favorite recipe in the mold, prepare and cool completely. Then turn it upside down — this flexible silicone mold offers a non-stick surface that allows the sweets to pop right out with a little push from the bottom. Remember to place the silicone mold on a baking sheet for easier positioning and removal. Create your own special desserts or homemade soaps with the Freshware SL-132RD 6-Cavity Oval Ring Silicone Mold for Soap, Cake, Bread, Cupcake, Cheesecake, Cornbread, Muffin, Brownie and more. This mold is constructed with 100 percent pure, premium-quality food-grade silicone, which meets US FDA and European LFGB safety standards (BPA-, PVC- and Phthalate-free). Simply pour your favorite recipe in the mold, prepare and cool completely. Then turn it upside down — this flexible silicone mold offers a non-stick surface that allows the baked goods to pop right out with a little push from the bottom. Remember to place the silicone mold on a baking sheet for easier positioning and removal. 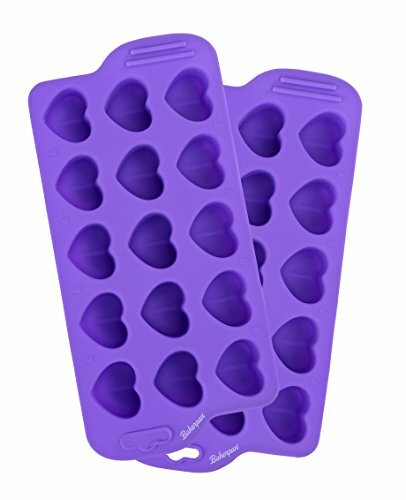 Make your own 8-bit and 16-bit heart candies with this Rosanna Pansino Silicone Heart Candy Mold. These designs wereThis mold contains two designs and can be used with Rosanna Pansino Candy Melts candies or Rosanna Pansino Cherry Gummy Mix.